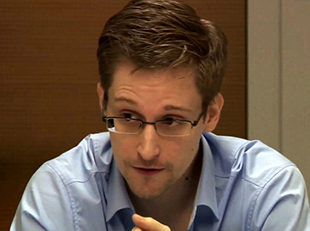 Young adults are significantly more supportive than their elders of Edward Snowden and his leaks of classified details of the National Security Agency’s telephone and internet surveillance programs, a new Pew Research Center/USA TODAY survey finds. But when it comes to the programs themselves, there’s much less difference between age groups. Young adults express similar levels of disapproval about the NSA surveillance programs Snowden disclosed than older groups: 59% of 18- to 29-year-olds, compared with about half of adults ages 50 and over. And about half of each age group say there aren’t adequate limits on what phone and internet data the government can collect. 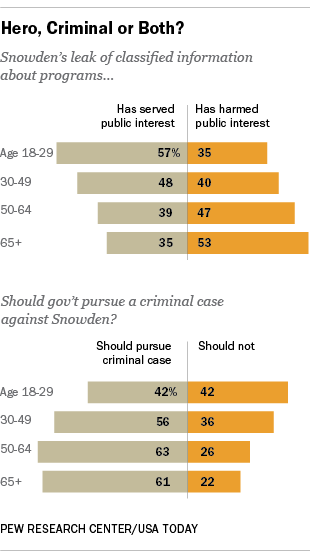 The divide between younger and older people on Snowden and his leaks resembles the attitudinal split more than three years ago following the Wikileaks release of secret U.S. diplomatic cables. In a December 2010 Pew Research survey, 39% of young adults said the Wikileaks disclosures served the public interest and 40% said they had harmed it; adults 65 and over overwhelmingly (65% to 24%) said the Wikileaks disclosures harmed the public interest. More generally, strong majorities of all age groups agree that “Americans shouldn’t have to give up privacy and freedom in order to be safe from terrorism.” But people younger than 50 were significantly more supportive of that position than 50-and-overs were.